Our trip to Gloucester for the 18th Sabra/Sabre meeting was great but with a touch of poignancy. In tribute to the late Geoff Cooper, who had started the organisation of the event prior to his sudden death, we named the meeting “The Geoff Cooper Memorial Rally”. The trip started for us on the Friday. 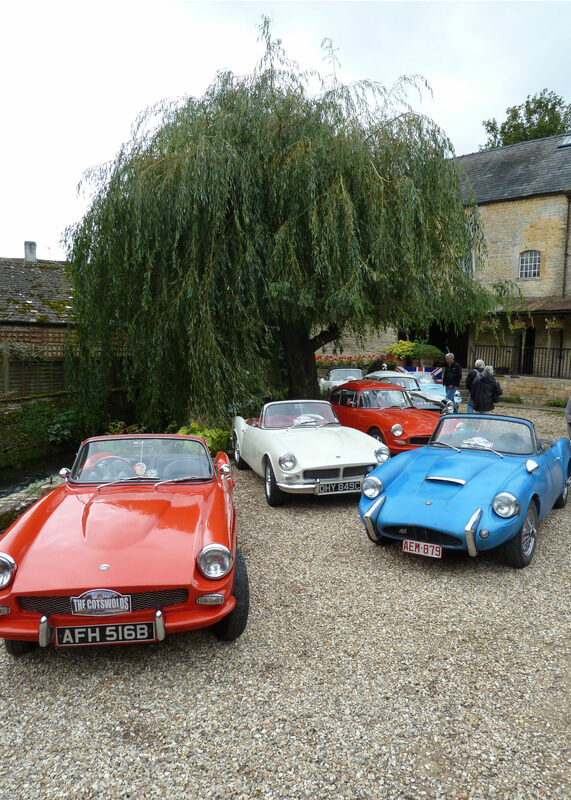 We took our white Sabre Six convertible and drove in convoy with our Belgian Sabra owning friends up en-route with Geoff Richards who had kindly agreed to drive our blue Sabra Prototype on the event. Our journey went well with only a little splatter of rain after lunch when Geoff, who was bravely driving with the top down, got a little damp. 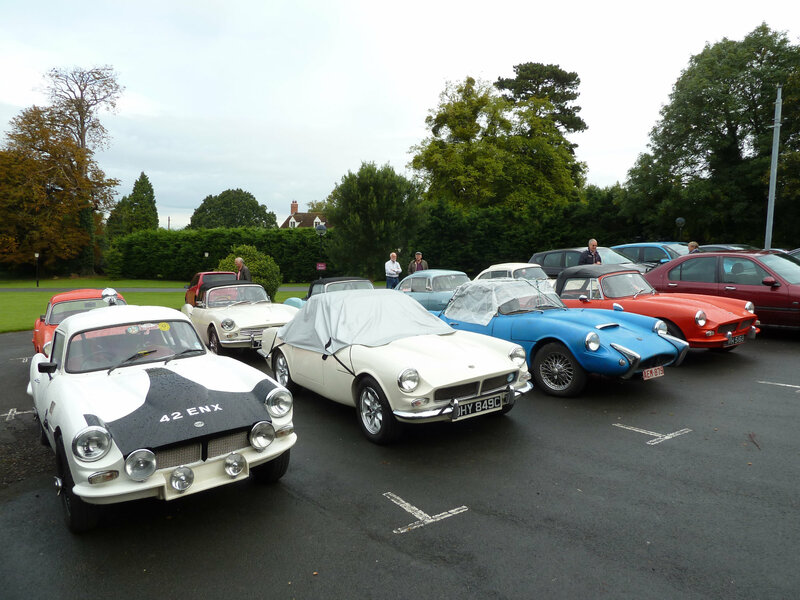 It was lovely to drive up to the Bowden Hall Hotel and see some of the other cars already parked there. This was the moment when we gathered the most Sabres/ Sabras during the weekend, nine in total. Greetings over, we all enjoyed a good dinner before our leisurely start on Saturday morning . Breaking with tradition we were taken by coach into Gloucester city centre where we first enjoyed a guided tour of the cathedral during which, amongst all sorts of other fascinating snippets of information, we were told of the difference between Norman and Gothic architecture (rounded and pointed arches respectively). Our knowledgeable and entertaining guide assured us that that was all we needed to know! 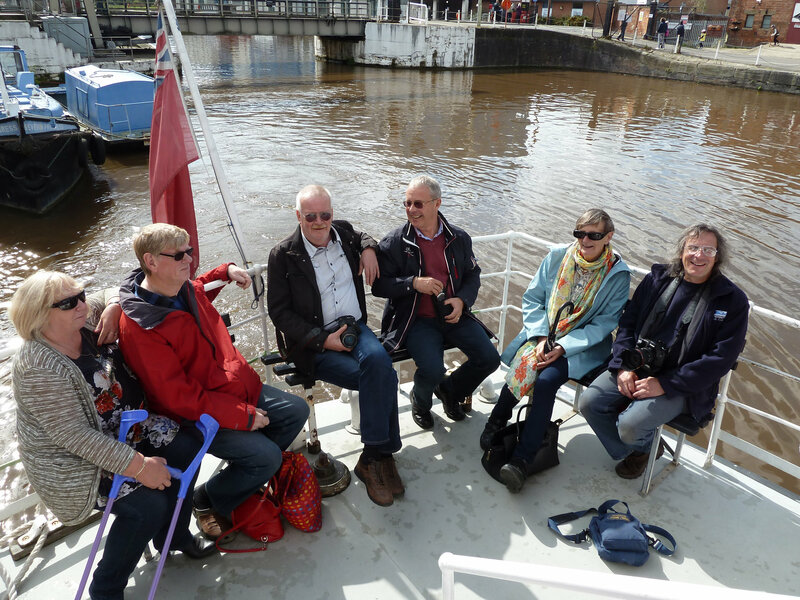 After a light pub lunch we strolled down to the Quays where we took a boat trip along the Gloucester and Sharpness canal, again with a very knowledgeable and entertaining guide. At the end of the day our coach returned us back to our hotel where we again enjoyed a very pleasant dinner. John Valler, who had known Geoff Cooper for most of his life, said a few nice words about Geoff and handed out special key rings in his memory. 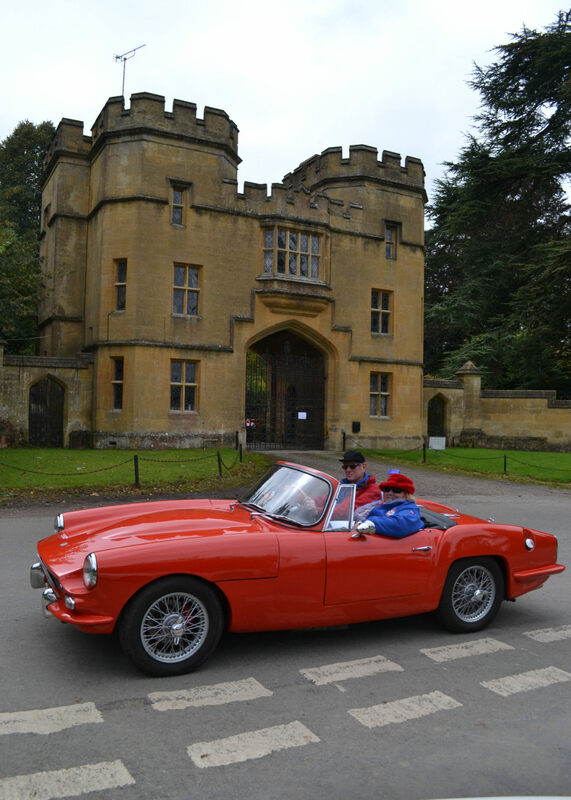 On Sunday we enjoyed a pretty drive, via the attractive spa town of Cheltenham, to Prescott Hillclimb where we had secured special parking in front of the Bugatti Trust Museum. 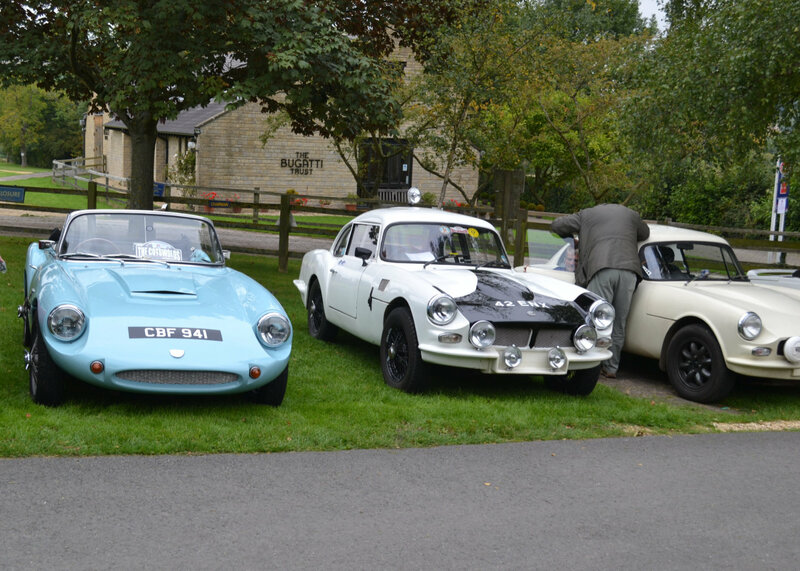 We were able to mingle with other clubs, Jaguar and Lotus 7 to name but two, who were there for a breakfast club meeting. The Bugatti Trust had kindly agreed to open their museum especially for us so we were also able to look round there and learn about the history of Bugatti. 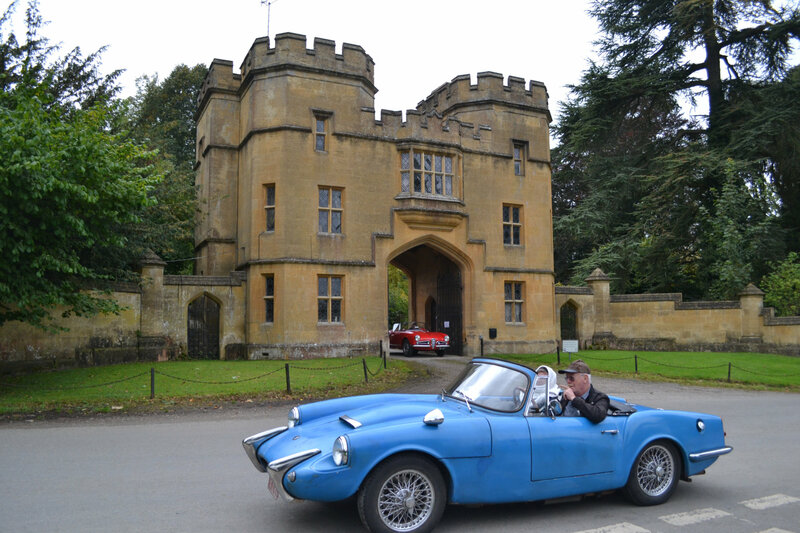 Afterwards we drove through the countryside to Bourton-on-the-Water where again we enjoyed privileged parking in front of the Cotswold Motoring Museum. The village is very picturesque and we had time to wander around, enjoy a lunch and visit the museum before leaving for the drive back to our hotel. 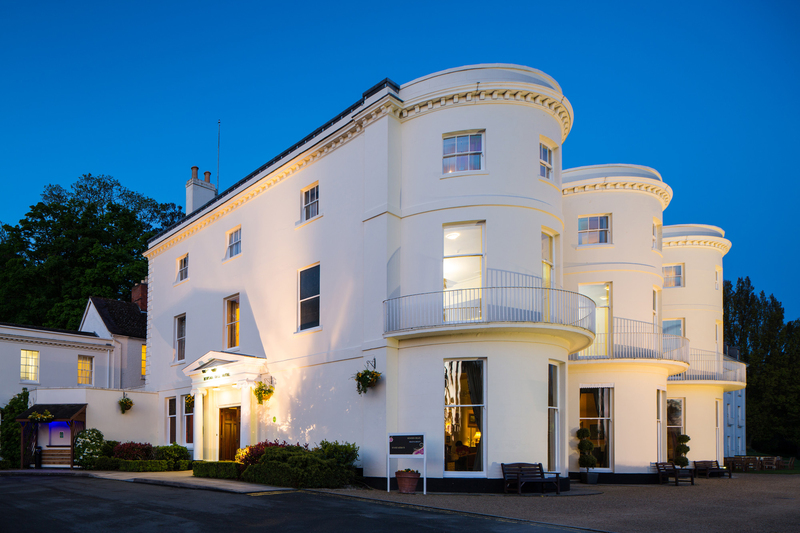 An added bonus was the sunshine that greeted us on our return allowing us to sit in the hotel’s impressive grounds and enjoy pre dinner drinks and a chat in the sun. It was good to see some local RSSOC members who had come along at various times during the weekend to say hello and see our cars. It was nice to see Geoff Pinch at Prescott, albeit without his Sabre. Also many thanks to Jim King and Dave Poole who “tested” our routes just before the event and joined us over the weekend. As ever the weekend flew by and we were soon bidding everyone farewell and looking forward to our 2018 meeting. A total of 8 Sabres and 1 Sabra were present for the meeting. This included the Sabre Six of Philip Needham, driven all the way from Berkshire to join us briefly on Friday evening. It was also great to meet up for the first time with Ken and Pat Trickett who brought their ex-works rally Sabre Four, 7EUE, all the way from Penryn in Cornwall. As well as the ex Geoff Cooper Sabre Six 419EFH, the Valler family brought the ex-works Sabre Four, 42ENX, so these famous rally cars were together for the first time since the early 1960s. Our two cars covered about 400 miles from home to home. the Prototype managed a fuel consumption of 34mpg while the Sabre Six managed 24mpg. A bigger difference than we would have expected, perhaps partly down to Geoff’s very smooth driving style. As far as we know all cars completed their journeys home without any problems.